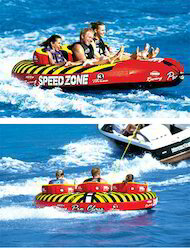 We feature a large selection of Towable Tubes, Boat Tubes and Water Tubes. We have Ski Tubes andTowablein all shapes and sizes. Banana Boats 4 persons upto 15 persons. This massive next generation Mable is ready to rock with Air Cushioned Side Walls to keep you from falling off, a high backrest, and custom graphics from head to toe. Sit, stand, lay, kneel or even lounge with up to 4 riders on this fully covered towable tube. Hook your tow rope up to either of the dual tow points for completely different riding experiences. The patented Aluminum Quick Connect Tow Point and Speed Safety Valve will save time to keep you on the water longer. Equipped with a Double Stitched Full Nylon Cover & Heavy Gauge PVC bladder this upgraded classic is ready for action! Team up with some friends and hop on the Great Big Mable for a ride like no other. Built for speed and dressed for fun. The Speed Zone Three is designed for three riders, providing a stable ride while easily sliding outside the wake for an exhilarating run! This fast track hot rod features a full nylon cover that is as durable as it is sleek, cockpit seating to keep you in the saddle, high backrests, air cushioned floors for a more comfortable ride, and double webbing foam handles to keep your white knuckles from turning red; Speed Zone Three will keep you in the zone! 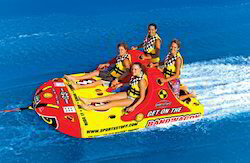 Looking for Inflatable Towables & Inflatable Banana Boats ?